Uglyworld #1516 - Stops Right Theres! (Project TW - Image 114-366), a photo by www.bazpics.com on Flickr. Babo: "Whats seemers to be the problemers?" Wage: "You wouldn't happens to knows about dissamappearing cookies?" 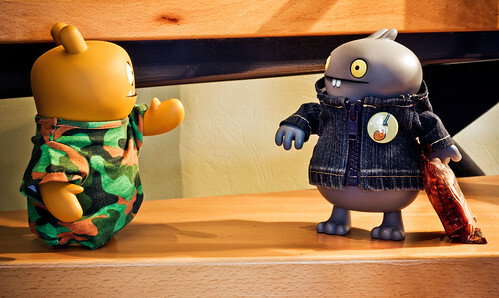 Babo: "Nopes, nots a singlers thing!" Wage: "Are you sures about thats?" Wage: "Then what are you hiderings behinds your back?" Babo: "Nothings, it musts just be an opticals inclusion!"